Over 55% of resolutions adopted by the Council since its creation have been on general thematic issues under its agenda item 3, (‘Promotion and protection of all human rights, civil, political, economic, social and cultural rights.’) By contrast, country-specific resolutions under its agenda item 4, (‘Human rights situations that require the Council’s attention,’) have comprised a mere 7% of its total output, and their range has been limited to only 12 situations. The imbalance is also reflected in the amount of time devoted to these two items during Council sessions: between 2010-2014, a total of 646 hours (26.9 days) was devoted to discussion and activities under item 3, compared to 153 hours devoted to item 4. These trends are clearly contrary to the Council’s principal mandate of ‘address[ing] situations of violations of human rights,’ as envisioned by heads of states and governments in GA resolution 60/1. While on average around 60% of Council resolutions adopted each year call on all states or the international community to take some kind of action, it is often difficult to assess how far these resolutions are being implemented because there is no systemic process of follow-up. The budget implications of Council resolutions have been increasing along with their number. 2014 was a record-breaking year in this regard, with the new resource requirements arising from resolutions – $19,018,800 – being only fractionally less than the combined total for 2012 and 2013 combined. There is a general lack of cross-fertilisation between issues dealt with by human rights resolutions and issues dealt with by the mechanisms of the Council, such as Special Procedures and the Universal Periodic Review. On average, somewhere between 45-50% of resolutions adopted in a given year had ‘sister’ resolutions on the same topic (and with exactly the same title) adopted the previous year, demonstrating a high degree of repetition in the Council’s output. While the number of resolutions submitted by ‘core groups’ of states has risen since the Council’s creation (making up just under 30% of the total in 2014), the proportion of resolutions adopted by consensus has decreased, dropping from 80% in 2007 to 69% in 2014. 56% of all human rights resolutions adopted by the GA’s Third Committee between 2012-2013 had a prima facie Council equivalents, and 40% of them had some degree of substantive overlap in their content, with a significant number repeating whole sections of Council resolutions word for word. These trends contradict, inter alia, the IBP’s call for ‘restraint in resorting to resolutions’ (paragraph 117(e)) and ‘minimizing unnecessary duplication of initiatives with the General Assembly/Third Committee’ (paragraph 117(e)(i)). They also reveal a failure to ‘take into account the constraints faced by delegations, particularly smaller ones’ (paragraph 113). 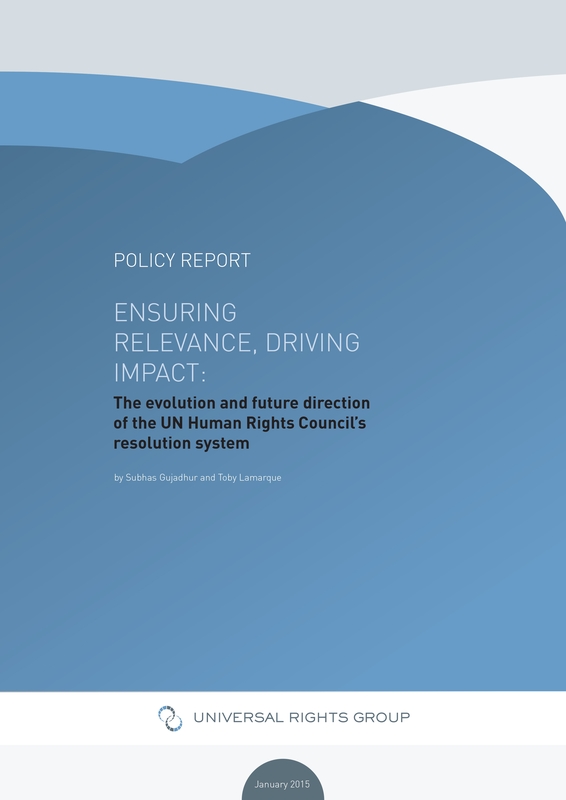 In light of the above, the authors of this report propose a series of recommendations aimed at making the UN’s human rights resolutions system more effective, efficient, relevant and sustainable by reorienting state behaviour in line with the parameters set by GA resolutions 60/1 and 60/251, the 2007 IBP, and the 2011 review outcome.